The WavePro HD high-definition oscilloscopes combine HD4096 12-bit technology and 8 GHz bandwidth for low noise and pristine signal fidelity. 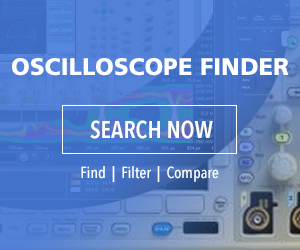 With a maximum of 5 Gpoints of fast, responsive, and easily navigable acquisition memory, WavePro HD oscilloscopes also acquire extremely fine waveform details over long periods of time. A deep, powerful toolset quickly exposes underlying system behaviors. All WavePro HD oscilloscopes feature a large 15.6-in., 1,900×1,080-pixel capacitive touchscreen and Teledyne LeCroy’s powerful MAUI with OneTouch user interface for intuitive, efficient operation. The instruments come in four models with bandwidths from 2.5 GHz to 8 GHz, all featuring sample rates up to 20 GS/s. At the heart of WavePro HD is a new 8-GHz chipset comprising a low-noise front-end amplifier and a 12-bit ADC. Competitive instruments either simply place a 10- or 12-bit ADC into a conventional 8-bit signal path, or use software techniques to sacrifice bandwidth for higher resolution. WavePro HD’s HD4096 technology provides the highest resolution and lowest noise at full bandwidth. WavePro HD’s MAUI advanced user interface makes it easy to find, navigate to, and thoroughly analyze waveform features of interest. The instruments can acquire 250 msec at the full 20-GS/sec sample rate, and always with 12-bit resolution. In WavePro HD, high-resolution analog inputs may be combined with optional mixed-signal oscilloscope (MSO) inputs for capture of a wide range of analog-sensor, digital logic, power-rail, serial-data, and other signals. A full complement of standard analysis tools is augmented by serial-data Trigger, Decode, Measure/Graph, and Eye-Diagram (TDME) options. When combined with Teledyne LeCroy’s toolbox and toolsets for high-speed serial-data jitter analysis and protocol compliance, users have at their fingertips a dream debug and analysis solution for deeply embedded computing systems. WavePro HD’s high bandwidth and high vertical resolution are suited for measurement and analysis of on-die and system PDN behavior. High bandwidth means accurate characterization of high-speed, on-die effects such as ground bounce, while WavePro HD’s high dynamic range and 0.5% gain accuracy ensure complete confidence in sensitive measurements such as rail-collapse characterization. The exceptionally low noise floor, combined with spectrum analyzer software tools, helps extract and identify the most subtle PDN aggressors. The RP4030 4-GHz power-rail probe completes the WavePro HD’s power-integrity capabilities by combining flexible connectivity options with a pristine signal path. For serial-data analysis, 12-bit resolution, a low noise floor, and exceptionally low timebase jitter (60 fsec) give the WavePro HD advantages in jitter and noise measurements. The optional SDAIII CompleteLinQ package comprises a complete set of serial-data jitter and vertical noise analysis tools, while optional QualiPHY serial-data compliance packages simplify physical layer validation. WavePro HD has a new 8 GHz, BNC-compatible ProBus2 probe interface. New 8- and 6-GHz ProBus2 probes connect directly to the WavePro HD, as well as to the 4-GHz ProBus interface on other Teledyne LeCroy oscilloscopes. Additionally, ProBus-compatible probes also work with the new ProBus2 interface without adapters, ensuring compatibility with Teledyne LeCroy’s extensive range of existing probes.